A three year old Rhodesian Ridgeback presented with an history of an abnormal gait and adopting the praying position. A significant indentation was present in the mid- back just cranial to the thoracolumbar junction. 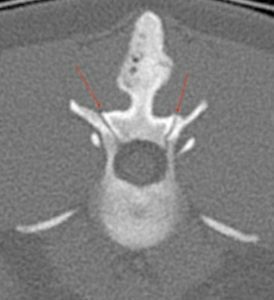 Spinal CT showed that the dorsal spinous processes of all the vertebrae from T13-S3 were relatively larger than normal. In addition, there was very close approximation of the dorsal spinous processes of L1 and L2 where they indeed touched each other and their opposing surfaces very irregular. A nodular, bulbous appearance of the two dorsal spinous processes with an irregular honeycomb-like appearance of the bone where they meet and potentially join together. The caudal articular facets of L1 and the cranial articular facets of L2 are also asymmetric. 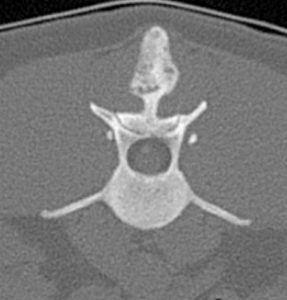 This patient has Baastrup’s disease – also known as “kissing spines syndrome”. Baastrup’s disease is a rare and poorly described condition in dogs as well as in man. It is a degenerative process involving the dorsal spinous processes where they touch each other. It may be related to back pain due to repetitive strain on the interspinous ligament with resultant oedema and inflammation of the paraspinal soft tissues and the development of thickening of the spinous processes and potential articular facet asymmetry. The conspicuous depression felt in this dog’s back is likely due to the relatively large T13 and L1-2 spinous processes which make it appear as though there is a depression cranial to them. Such vertebrae may well be the cause of discomfort particularly after a long period of exercise.